McCarthy Point Lookout was constructed in 1936 by the Conservation Corps and was used as an observation point for detecting fires from 1937 to the mid 1960s, and for aircraft spotting during World War II. 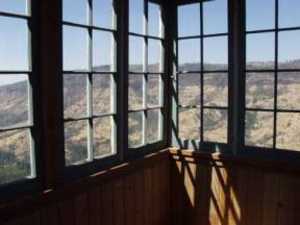 Now inactive as a fire lookout, the cabin is available for recreational use. It has two rooms - a kitchen and bedroom. The "bedroom" is surrounded on three sides by windows, has overhead propane lights, two sleeping platforms (about the size of twin beds) and six old style army cots. The McCarthy Point Lookout Rental is approximately 3,600 feet above sea level and is located in a very remote area of the Lassen National Forest. Open after March 1st. Calpine is a forest fire lookout tower that was constructed in 1934 by the Civilian Conservation Corps, and is one of three remaining examples of the enclosed windmill-style lookout in California. The top room or observation cab is the only rented space at this time. Calpine sits at an elevation of 5,980 feet in the Sierra Nevada Mountains of Tahoe National Forest, approximately 40 miles from Truckee. The lookout is ideally suited for over-the-snow ski or snowmobile access. The interior of the cabin measures 14' by 14' and currently has two single beds, a dry sink, a table and four chairs, three propane lights, a propane heater, a propane stove/oven and a fire finder. The lookout does not have electricity or water. The Girard Ridge Lookout was constructed in 1931 and was used by the Forest Service on a regular basis until 1981. The lookout was restored close to its original condition in 1997. It is available for rent seasonally on a permit basis. Permits are issued on a "first come-first served" basis to anyone 18 years or older. The rental fee is $75 per night for a party of 4 or fewer people. Black Mountain Lookout is located on the eastern edge of the Beckwourth Ranger District, 10 miles from Highway 395, near Milford, California. The lookout tower is available for reservations May 26 through November, offering guests a unique lodging experience in Plumas National Forest. Guests at Black Mountain Lookout are treated to striking views of Honey Lake to the north, and Last Chance Creek to the south.